THE GLOW, JULY-OCTOBER 1998 The Glow, July-October 1998. Official Publication of CNCHS - Cabatuan National Comprehensive High School Cabatuan, Iloilo, Panay Island, Philippines OFFICIAL PUBLICATION OF THE CABATUAN NATIONAL COMPREHENSIVE HIGH SCHOOL Cabatuan, Iloilo Member: National Secondary School Paper Association ilk 1~ryFM i6 )c VOL. 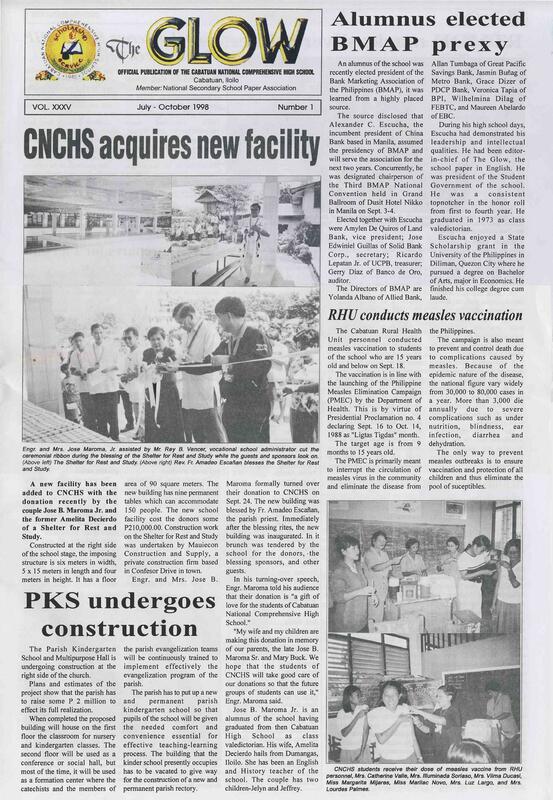 XXXV	July - October 1998	Number 1 on CNCHS acquires new facility Engr and Mrs. Jose Maroma, Jr assisted by Mr Rey S. Vencer, vocational school administrator cut the ceremonial ribbon during the blessing of the Shelter for Rest and Study while the guests and sponsors look on. (Above left) The Shelter for Rest and Study. (Above right) Rev. Fr. Amadeo Escahan blesses the Shelter for Rest and Study. A um el e,-, rte BMAP prexy A new facility has been added to CNCHS with the donation recently by the couple Jose B. Maroma Jr. and the former Amelita Decierdo of a Shelter for Rest and Study. Constructed at the right side of the school stage, the imposing structure is six meters in width, 5 x 15 meters in length and four meters in height. It has a floor The Parish Kindergarten School and Multipurpose Hall is undergoing construction at the right side of the church. Plans and estimates of the project show that the parish has to raise some P 2 million to effect its full realization. When completed the proposed building will house on the first floor the classroom for nursery and kindergarten classes. The second floor will be used as a conference or social hall, but most of the time, it will be used as a formation center where the catechists and the members of area of 90 square meters. The new building has nine permanent tables which can accommodate 150 people. The new school facility cost the donors some P210,000.00. Construction work on the Shelter for Rest and Study was undertaken by Mauiecon Construction and Supply, a private construction firm based in Confesor Drive in town. Engr. and Mrs. Jose B. the parish evangelization teams will be continuously trained to implement effectively the evangelization program of the parish. The parish has to put up a new and permanent parish kindergarten school so that pupils of the school will be given the needed coin fort and convenience essential for effective teaching-learning process. The building that the kinder school presently occupies has to be vacated to give way for the construction of a new and permanent parish rectory. Maroma formally turned over their donation to CNCHS on Sept. 24. The new building was blessed by Fr. Amadeo Escafian, the parish priest. Immediately after the blessing rites, the new building was inaugurated. In it brunch was tendered by the school for the donors, -the blessing sponsors, and other guests. In his turning-over speech, Engr. Maroma told his audience that their donation is "a gift of love for the students of Cabatuan National Comprehensive High School." "My wife and my children are making this donation in memory of our parents, the late Jose B. Maroma Sr. and Mary Buck. We hope that the students of CNCHS will take good care of our donations so that the future groups of students can use it," Engr. Maroma said. Jose B. Maroma Jr. is an alumnus of the school having graduated from then Cabatuan High School as class valedictorian. His wife, Amelita Decierdo hails from Dumangas, Iloilo. She has been an English and History teacher of the school. The couple has two children-Jelyn and Jeffrey. An alumnus of the school was recently elected president of the Bank Marketing Association of the Philippines (BMAP), it was learned from a highly placed source. The source disclosed that Alexander C. Escucha, the incumbent president of China Bank based in Manila, assumed the presidency of BMAP and will serve the association for the next two years. Concurrently, he was designated chairperson of the Third BMAP National Convention held in Grand Ballroom of Dusit Hotel Nikko in Manila on Sept. 3-4. Elected together with Escucha were Amylen De Quiros of Land Bank, vice president; Jose Edwiniel Guillas of Solid Bank Corp., secretary; Ricardo Lepatan Jr. of UCPB, treasurer; Gerry Diaz of Banco de Oro, auditor. The Directors of BMAP are Yolanda Albano of Allied Bank, The Cabatuan Rural Health Unit personnel conducted measles vaccination to students of the school who are 15 years old and below on Sept. 18. The vaccination is in line with the launching of the Philippine Measles Elimination Campaign (PMEC) by the Department of Health. This is by virtue of Presidential Proclamation no. 4 declaring Sept. 16 to Oct. 14, 1988 as "Ligtas Tigdas" month. The target age is from 9 months to 15 years old. The PMEC is primarily meant to interrupt the circulation of measles virus in the community and eliminate the disease from Allan Tumbaga of Great Pacific Savings Bank, Jasmin Bufiag of Metro Bank, Grace Dizer of PDCP Bank, Veronica Tapia of BPI, Wilhelmina Dilag of FEBTC, and Maureen Abelardo of EBC. During his high school days, Escucha had demonstrated his leadership and intellectual qualities. He had been editorin-chief of The Glow, the school paper in English. He was president of the Student Government of the school. He was a consistent topnotcher in the honor roll from first to fourth year. He graduated in 1973 as class valedictorian. Escucha enjoyed a State Scholarship grant in the University of the Philippines in Diliman, Quezon City where he pursued a degree on Bachelor of Arts, major in Economics. He finished his college degree cure laude. the Philippines. The campaign is also meant to prevent and control death due to complications caused by measles. Because of the epidemic nature of the disease, the national figure vary widely from 30,000 to 80,000 cases in a year. More than 3,000 die annually due to severe complications such as under nutrition,	blindness,	ear infection,	diarrhea	and dehydration. The only way to prevent measles outbreaks is to ensure vaccination and protection of all children and thus eliminate the pool of suceptibles. U A P K derg a n s t r u &0 t RHU conducts measles vaccination CNCHS students receive their dose of measles vaccine from RHU personnel, Mrs. Catherine Valle, Mrs. Illuminada Soriano, Mrs. Vilma Ducasi, Miss Margarita Mijares, Miss Marilac Novo, Mrs. Luz Largo, and Mrs. Lourdes Palmas.